The focus of the 2016 Gestational Diabetes Mellitus (GDM) Guideline is on the treatment of women with gestational diabetes. The overall objective of the guideline is to provide evidence-based medical nutrition therapy recommendations for management of GDM that assist in achieving and maintaining glycemia. View the results of 12 evidence analysis questions by using the links on the left. Adverse maternal outcomes: mortality, mode of birth (e.g., c-section, labor induction), hypertension/preeclampsia, insulin therapy. The 2016 GDM guideline complements the 2008 GDM guideline. Download the GDM Guideline Comparison Table to see changes between the newly published and previous guideline. Since not all of the 2008 recommendations were updated/reviewed, the results of the previous systematic review remain an accessible resource. Please use the left navigation bar to view the GDM guideline and supporting evidence. Expand the sections below for a listing of individuals who contributed to the development of the GDM projects. About the Archive: The EAL is designed so that the most current information is available at the top of the left navigation bar. The older content remains accessible as a resource. Click on the tab titled GDM Archive to access all of the archived content. 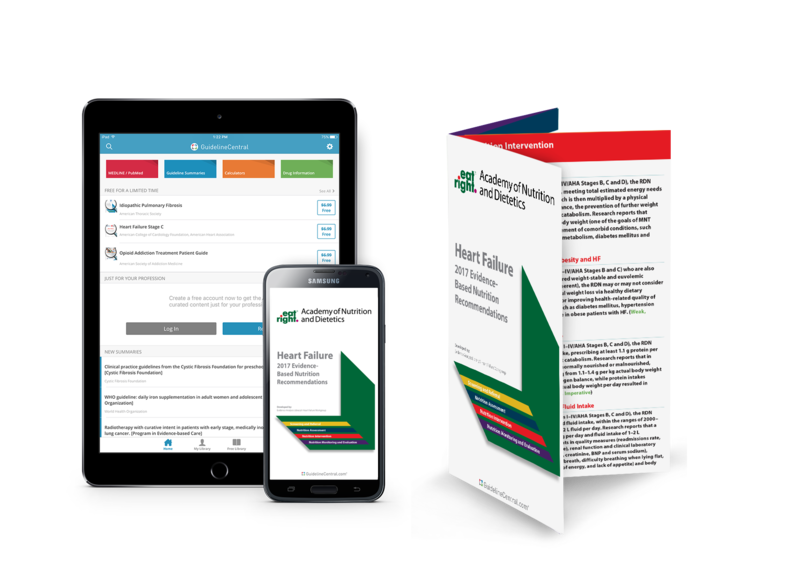 Expand the Project Resources section to learn how to purchase the 2016 Gestational Diabetes (GDM) Evidence-Based Nutrition Recommendations Pocket Card. Gestational Diabetes (2008) Toolkit - this toolkit is designed to assist the registered dietitian in applying the Academy's 2008 Gestational Diabetes Evidence-Based Nutrition Practice Guideline. The toolkit includes material such as interactive sample documentation forms, encounter process instructions, outcomes monitoring forms and three comprehensive case studies. The toolkit incorporates the Academy Nutrition Care Process and Standardized Language for patient/client care. Click to order. GDM 2016 Guideline Presentation - this 49-slide MS PowerPoint presentation includes all the recommendations and ratings of the 2016 Gestational Diabetes Evidence-based Nutrition Practice Guideline. Ideal for you to use for meetings, in-service presentations and classes (not designed for the consumer). Click to order. Gestational Diabetes 2016 Evidence-Based Nutrition Recommendations Pocket Guide - This practical quick-referece pocket guide contains the GDM2016 evidence-based graded recommendations. Available in print and digital formatl.